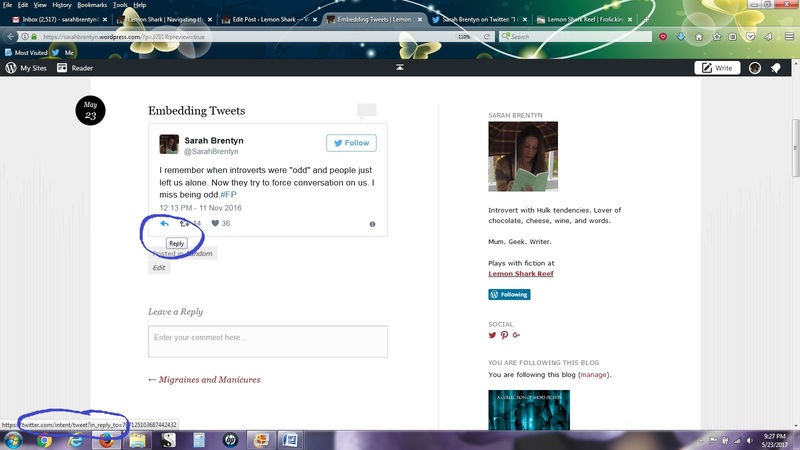 I shared how to embed tweets in a blog post but you may be asking yourself why you’d want to. These embedded tweets are… Psst… Come closer… *whispers* Interactive. I know, right? How cool is that?! 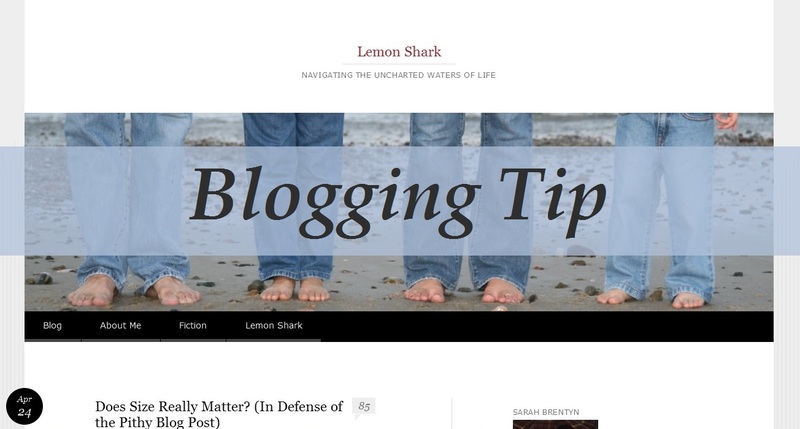 Readers can do anything right from your blog. Everything is clickable. It’s basically a live tweet. One that you’ve highlighted. One that you want to share with your blog readers. I do like Twitter but, let’s face facts, that thing moves like ticker tape. It’s so easy to miss tweets from your tweeps. Depending on how often you post, that tweet is going to be much more visible here. Regardless, it makes for a fun post and people can interact with each tweet by liking, retweeting, and even replying to it right from your blog. Catch tweeps who may have missed your tweet. Reach blog buddies who may not be following you on Twitter. Create synergy between your blog and social media. 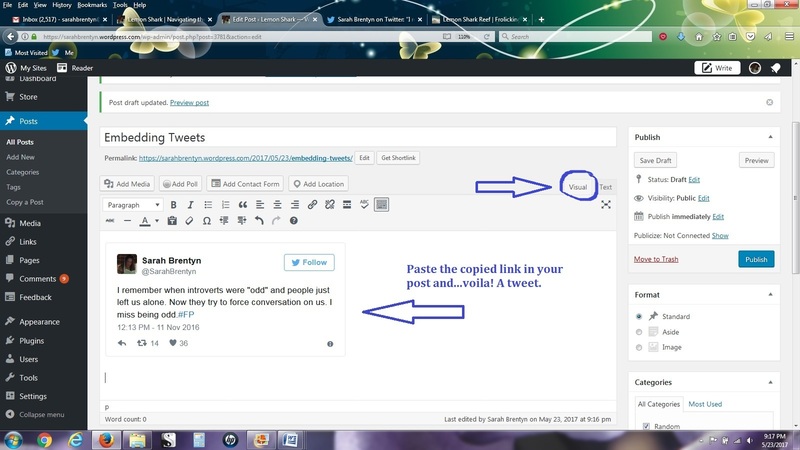 Create a blog post composed entirely of tweets (e.g. a compilation of micro fiction). Get inspiration. Transform a tweet into a longer piece. Promote your writing…new releases, cover reveals, trailers, etc. 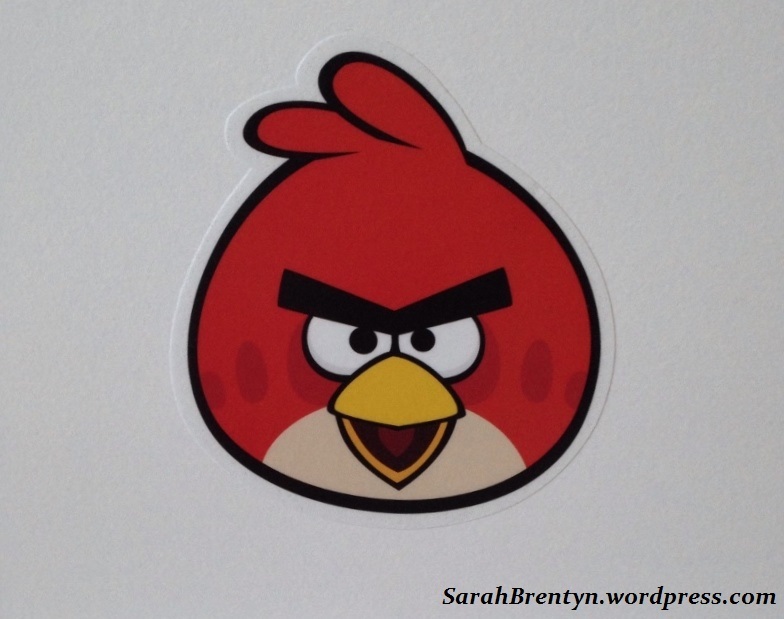 This allows readers to…well…follow you. Readers can reply to your tweet right here. 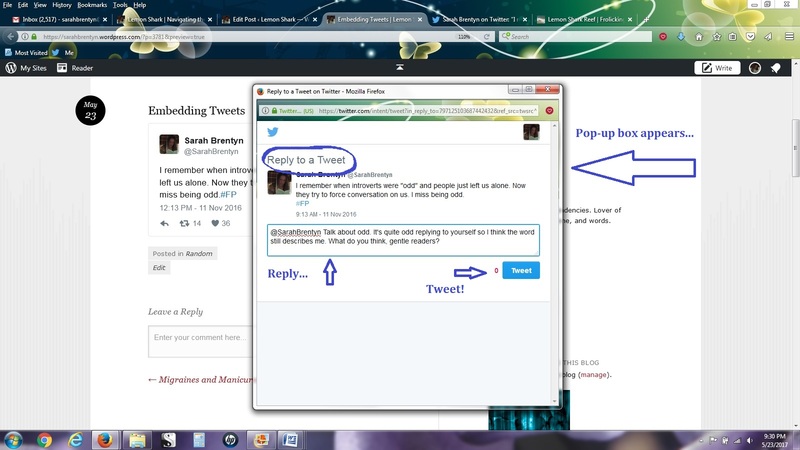 A pop-up box appears, they write 140 characters (or less) in reply to you, then click “tweet”. This shows up on their timeline and yours. Nice! * I tried a poll a few years ago and, when I posted about it, most bloggers said they hadn’t seen the poll on Twitter. 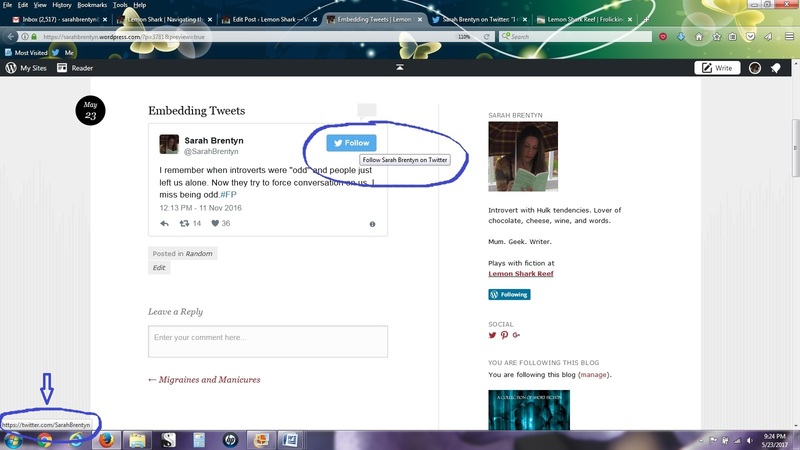 If you embed it, both your blogging friends and your tweeps can vote. Happy blogging (and tweeting) days, my friends! Tweets aren’t just for Twitter anymore. Here’s a neat thing you can do with those tweets right here on your WordPress blog. It’s wicked cool. And easy. 3 steps…done. All of you lovely bloggers know I’m not a techie but I wanted to share this fun find with you. First we’re going old school with a “cut and paste” URL option, then we’ll embed an html code like we know what we’re doing. No need to hurt your eyes squinting at the screenshots—you can click to enlarge them. Let’s get tweeting on our blogs. Choose the tweet you want. Click on the cute, little grey v-shaped thingy in the top, right corner. 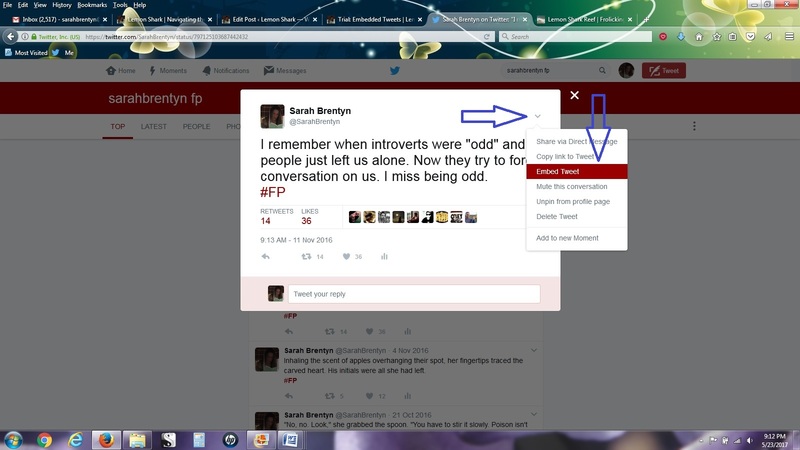 You’ll see a drop-down menu with all sorts of neat things like “pin to your profile page” (or “unpin” if it’s already pinned), “share via DM”, and “delete tweet” (for those times when Twitter decides to add a typo after you’ve posted). Click on “Copy link to Tweet”. Open a post and paste the copied link. You’ll be in “visual” view for this. Hey! There’s a tweet! 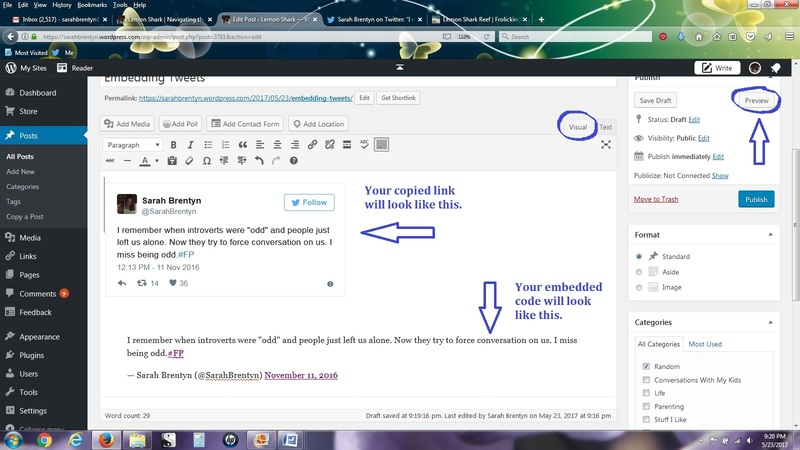 Copying the link works well on WordPress but may not work on other platforms. 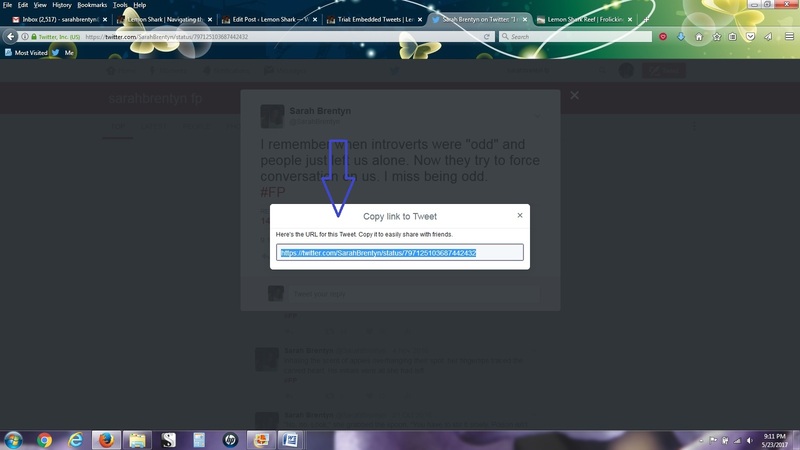 On a website, for example, this option will simply create a URL to the tweet. We’re going to embed that tweet now. Hold on to your hats. Choose the tweet you want. Click on the cute, little grey v-shaped thingy in the top, right corner. There’s that drop-down menu. 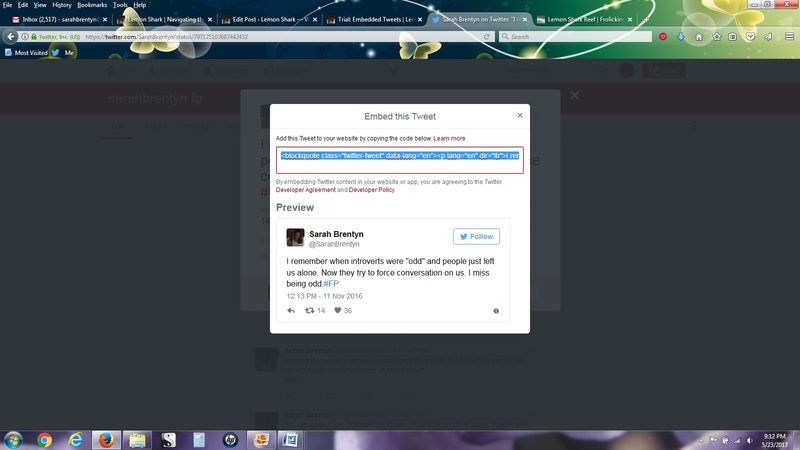 Click on “Embed Tweet”. Here is what you’ll see. Select and copy the html code. Let’s switch to “visual” view and see what happens… There they are! Except, erm, they look different. Click “Preview”. No worries! When you preview, they look the same. 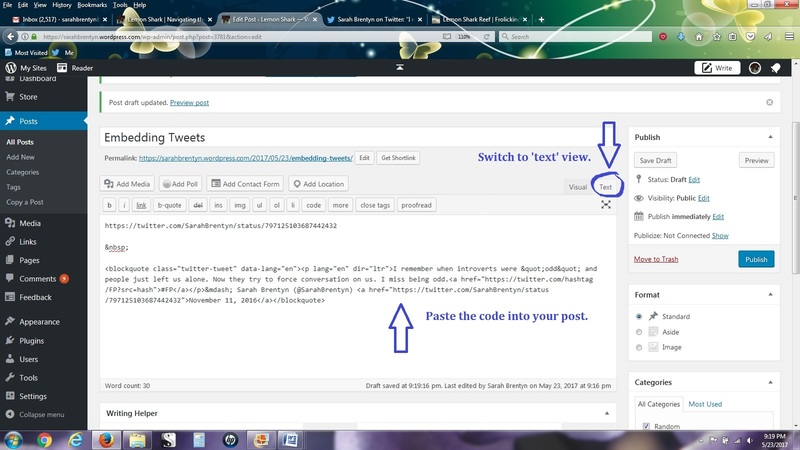 Embedding has a few more options and benefits but, for the sake of brevity (and for those who don’t play well with html), these are two ways to get a tweet into a WordPress post. Pick one, have fun, and tweet on. Tune in tomorrow, Same Bat-Time, Same Bat-Channel, for my follow-up post on embedding tweets. What they are and why you want to use them. Happy blogging days, my friends. I’m making a list. I’m checking it twice. I’m going to toast you. Naughty or nice. Seriously, it doesn’t matter. Either way, you’re good on my list. Every year, during the holidays, I watch A Christmas Carol and It’s a Wonderful Life. Numerous times. Many numerous times. And, while I watch these films, I eat yummy foods. And drink delicious beverages. Sometimes seasonal beer, sometimes red or white wine, sometimes a treat of something sweet like Baileys. It’s a tradition. Back to my list. I’m actually making one. For real. Leave a comment with your preferred movie. 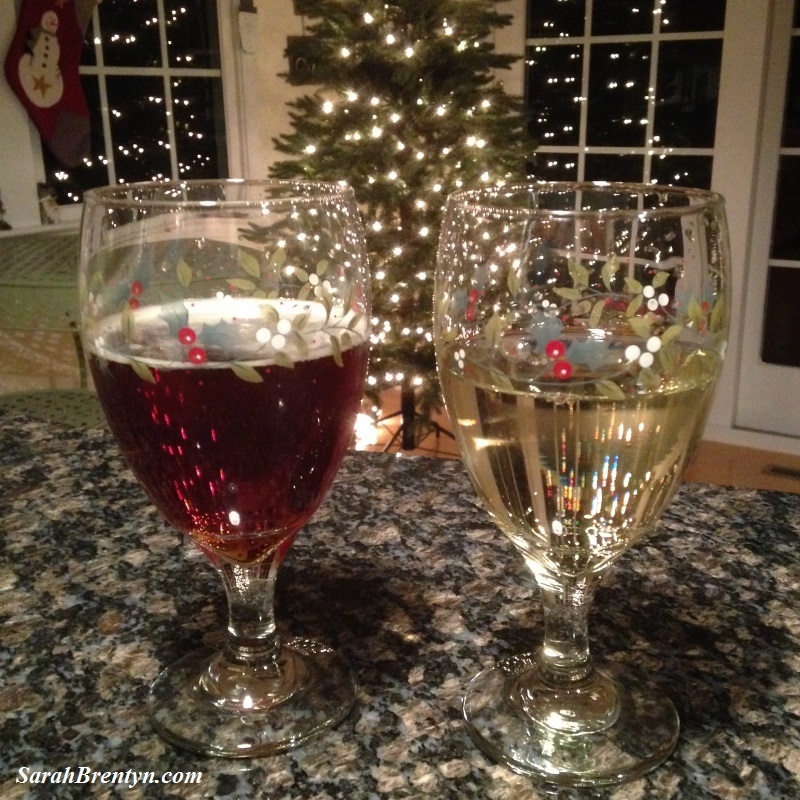 I will raise my glass to you in gratitude, good health, and a happy holiday. I just figured out I could retweet myself. I won’t lie. I played around with it a bit, hovering over those double arrows, clicking them, unclicking them, and generally goofing around. But, then, I got to thinking about how I use my Twitter account. As I’ve mentioned, I mine my own tweets for future short stories and flash. So it might be kinda cool to revisit a piece of micro fiction and have it show up on the timeline of someone who missed it. Then again, I could just pin it or copy and paste it into a new tweet… So, I guess, I’m back to my first reaction. 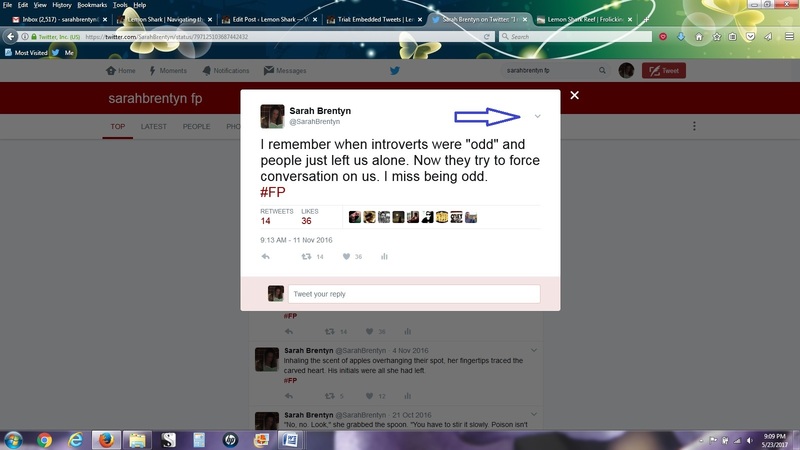 Retweeting yourself is weird. Do you retweet yourself? Did you know you could retweet yourself? Do you find any benefits to retweeting yourself that I’m completely missing? Did you notice how I just like saying ‘retweet yourself’ because I’m immature and find it amusing? As you know, I created a writing prompt for my tweeps. It’s been wicked fun and I know a couple writers who have already used their tweets to write a flash or blog post (myself included). But this is a new venture and I’m working out the kinks. 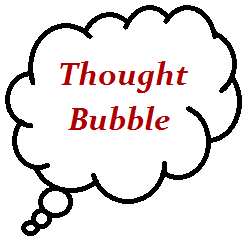 So, today, I’ve ditched my poor Thought Bubble in favor of a follow-up FAQ to the original #Tweets4Blogs post. I have a hat. For real. I’m using the old pick-a-name-out-of-a-hat trick. (Hee. Hat trick. Nice.) Anyway, each week, I’ll put in slips of paper with forms on them (1 line, memoir, haiku, etc.) to decide what we’ll be writing that week. Yes. This is exactly what you’ve gotten yourself into. A prompt from a hat. But, hey, don’t underestimate the power of a hat. I mean, Harry Potter was sorted by one. It gave him a sword to defeat the basilisk in the (secret) chamber of secrets. Also, it sings. Wicked powerful. After the hat business, I’ll make up a prompt. It’s going to be silly sometimes so bear with me. Remember our mantra: It doesn’t have to be good, it just has to be done. I want you to have buckets full of gems to dig through for your blog so, when I create the prompt, I’ll keep that in mind. But I’ll also be thinking that I want you to have fun. Don’t take yourself too seriously. It’s unbecoming. And not allowed. I’m very strict about this rule. Eh. No rules. (But here is a “FAQ” or “Q&A” page.) Also known as “FYI”. Pick one. The tweets from the last few weeks? Amazing. I’m blown away by the variety and quality of responses. Just awesome. Why the heck are you doing this? To give you inspiration for your blogs (flash fiction, short stories, posts…whatever floats your boat). My glorious reward? Reading your awesome writing and knowing you’re building a gold mine. Is there a due date? No. These are ideas, sparks of inspiration. For you. Sticking to Tuesdays gives you a better chance at making sure you write weekly but, basically, “whenever” is a good time to tweet. Should I “reply” to your tweet? 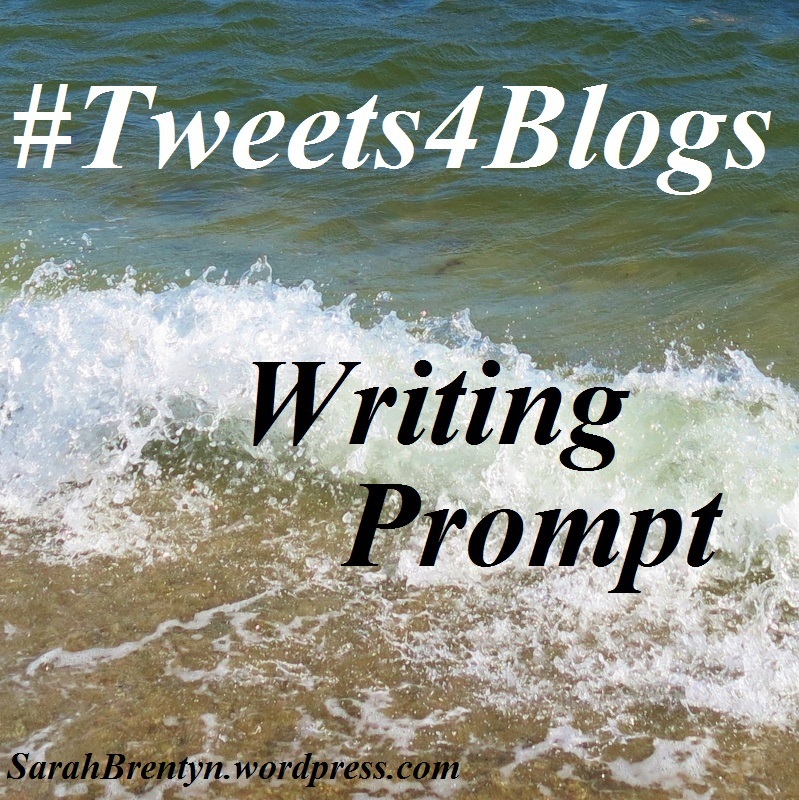 No need to “reply” to my prompt, just write your own tweet using the hashtag #Tweets4Blogs. Also, you don’t need to link back to me, my tweet, or my blog. These are for your own, special Twitter library. How do I write the hashtag? 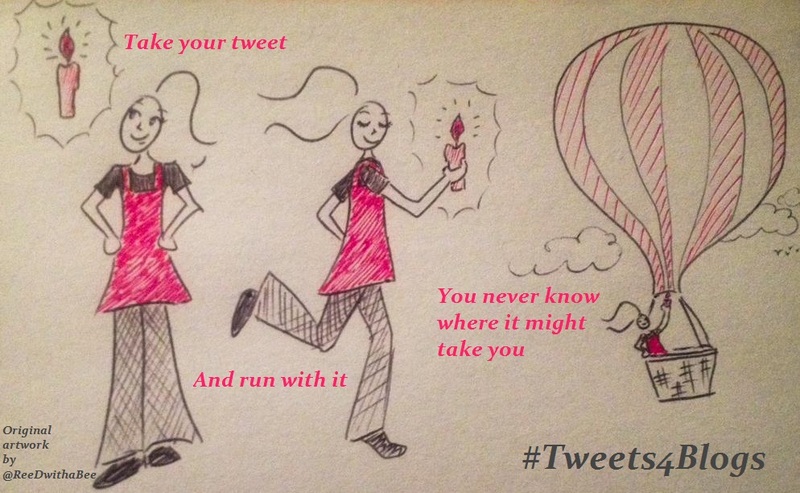 Hashtags are not case-sensitive so whether you write #Tweets4Blogs, #TWEETS4BLOGS, or #tweets4blogs, you’re good. What are we writing? We’ll be using various forms of poetry and prose (see Forms below). Each form should follow the prompt for that week. How many should I write? As many as you’d like. If you have time for one, write one. If you want to write two, ten, twelve, go for it. Will you RT every tweet? I’ve actually decided not to RT these. Here’s why. First, these are for you. I want the #Tweets4Blogs hashtag to be a fun way to get you tweeting interesting material that you can find in one quick step. Second, I don’t want to miss anyone. It is SO easy to do. (I know this because I missed a few last week.) How did I manage that? I’ll tell you. Writers respond to the prompt on different days. Also, some people participating in this have private accounts so their tweets don’t show up under the hashtag. In addition, some Twitter twerps have started using the hashtag for their own nefarious purposes and mucking up the feed. Damn them! (It’s only been two weeks—how did they even find us???) So there you have it. Just know I am reading and loving these tweets you’ve written. Haiku – A 3 line poem using the 5/7/5 format. First line 5 syllables. Second line 7. Third line 5. This will be anything from “cookies” to “a 7-yr-old trying to take over the world”. And, just like magic, all your words will pop up for you to admire and, hopefully, use on your blog. Go forth and tweet, my fellow word weavers! And, remember our mantra: It doesn’t have to be good, it just has to be done. “No, no! You’re thinking about this all wrong. Bad writing, clichés, fragments, adverbs… All good. This is a no-pressure prompt! Now go write!” See? No pressure. *mwah* Believe it or not, even what you think of now as “bad” writing can later spark an idea for a beautiful blog post. It happens. Trust me. See you on Twitter. Same Bat-Time, Same Bat-Channel. 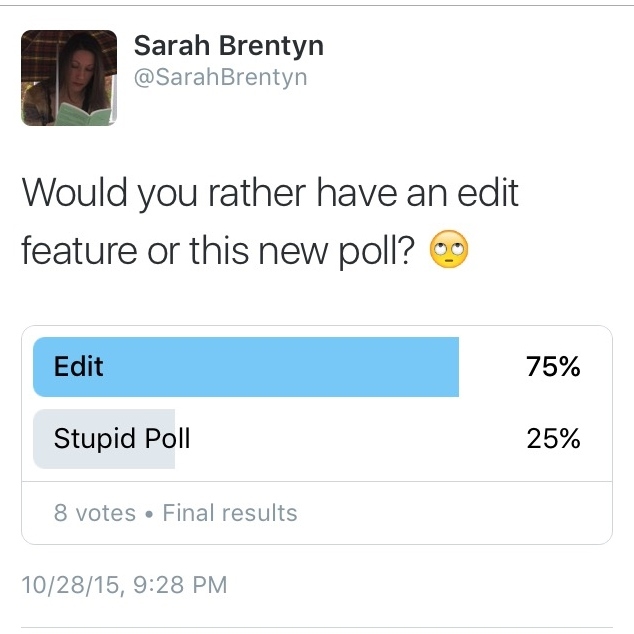 I sort of mocked the new poll feature on Twitter. And by “sort of”, I mean I did. It was rude. 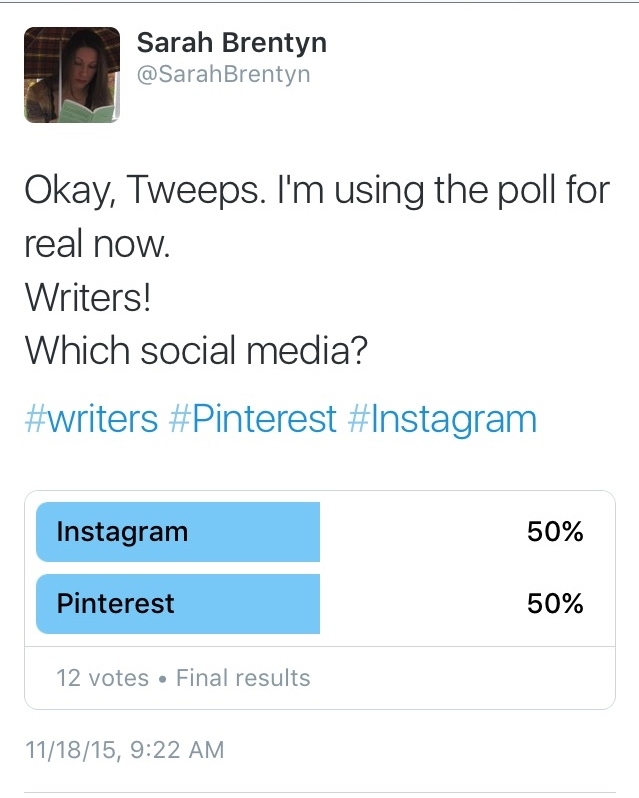 For writers, which is the better social media: Pinterest or Instagram? But I really wanted to know this. Most of you are aware that I’m not interested in spending more time on social media. If I decide to get a new account, I need it to be beneficial. Wait. WHAT? Are you serious? A tie? A 50/50 split? Stupid poll. I was right. I don’t trust this thing. It’s evil. And I am back where I started. So now I’m using my blog as a poll. A better poll. I will get answers. I will know who voted. I will receive explanations as to why people voted the way they did. Right? Of course right. Thanks, gentle readers. Really, if you think about it, blogs are just big polls. Ooh! Also, I’ll give a gold star ⭐ to the first person to give the correct number of times the word “poll” (or “polls”) was used in this one poor post. But, see, it’s not. I mean, it is Hotel California but it’s not really funny. If you follow. 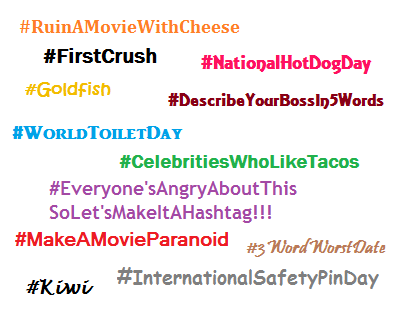 I have to get some shout-outs ready for (fill-in-the-blank) hashtag day. I need to acknowledge those mentions or RT something of theirs. I never tweeted my blog post from this week. I’ve got to catch up on reading blogs and tweeting them. I love this book—I wonder if the author’s on Twitter. Ooh! Some new Harry Potter covers! I have to tweet about that! My pull from social media is fairly mild. But it’s there and I worry about that. I don’t want to get caught (any more than I already am) in the tangled web of Twitter. Hotel California has been accused of being about a lot of different topics. That’s the beauty of this song—it’s about what it’s about but it can be applied to many situations where someone is stuck by his or her own device. 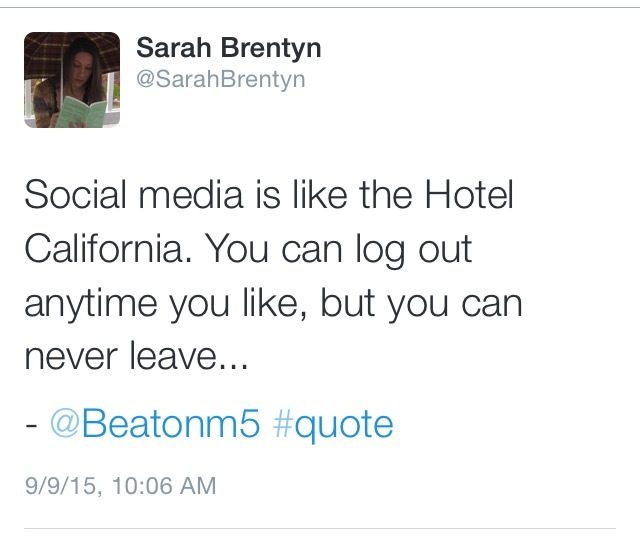 Can you log out any time you like? Can you really leave? Twitter Trends: Trash or Treasure? You’re on Twitter? So you know that sidebar with all the trends. It’s loaded with absurdity like #RuinAMovieWithBacon, #DescribeYourPoopIn4Words, and #LiesWeTellOurPetGiraffes. Then there are the ones with celebrity break-ups, fall-outs, nose jobs, nose rings, weight gain, weight loss, and what color their hair was yesterday. It’s fascinating. Really. There’s also breaking “news” trends (a.k.a. target practice). They scream, “Feeling aggressive? Ready for a virtual fight? Let your anger out right here!” And people do. Sometimes there are awesome trends, like #Hemingway, #Shakespeare, or #EmilyDickinson with fabulous quotes for nerds like me. Also, I have learned about some incredibly cool “holidays” like National Coffee Day and National Chocolate Day. It’s a mix. A dizzying display of words, names, places, and opinions. I tend to ignore them but with their bright bold font, it’s difficult not to at least notice them. Which is, of course, the point. And occasionally (before someone rats me out) I’ve been known to #RuinADateIn3Words or something equally silly. When I looked up the definition of “trending”, it actually had Twitter in the definition. I am quite serious. To be fair, that was online so I’ll smooth my ruffled feathers or dunk in the birdbath or whatever. change or develop in a general direction. (of a topic) be the subject of many posts on a social media website within a short period of time. Do you notice trends? Steal a glance to see if there’s something you’re interested in? Pointedly ignore them? Or actively seek them out to tweet about? It’s an unspoken rule that you don’t just disappear from social media. You don’t remove your blog or delete your Twitter and Facebook account without warning. You don’t keep those accounts and abandon them. Why? Because we have made connections. The “social” in social media is strange. I’ll confess to checking on people (discreetly—in DMs or emails) if I notice they’ve gone AWOL, and it truly is out of concern. I’m not trying to pry and yet, I wonder, is this appropriate? I think it depends on your relationship with the person. This is something I’ve been thinking about a lot lately. When did we become so attached to our cyber friends? How do we define online friendships? How much do we owe our readers and followers? Our facebook friends and tweeps? Why do we feel we must give an explanation for our sudden disappearance?